Moonwalk One is a snippet of immersive history from the day humans first stepped foot on the moon. Take the time to be lost in history with the stories, fears, excitement, and celebration of people who were there, and dream of a future in space. Moonwalk One is a documentary on the Apollo 11 moon landings originally produced in 1970. Remastered in 2007, NASA just uploaded it for everyone yesterday. It's fantastic to finally get this blast-from-the-past online and easily accessible to anyone itching with curiosity. At nearly two hours duration, it's not a quick watch, but you didn't have anything better to do today, right? What's with the deluge of discussing the moon landings? Yesterday marked the 45th anniversary of the launch propelling the astronauts into space. Today was a travel day, building up to the lunar landing on July 20th. 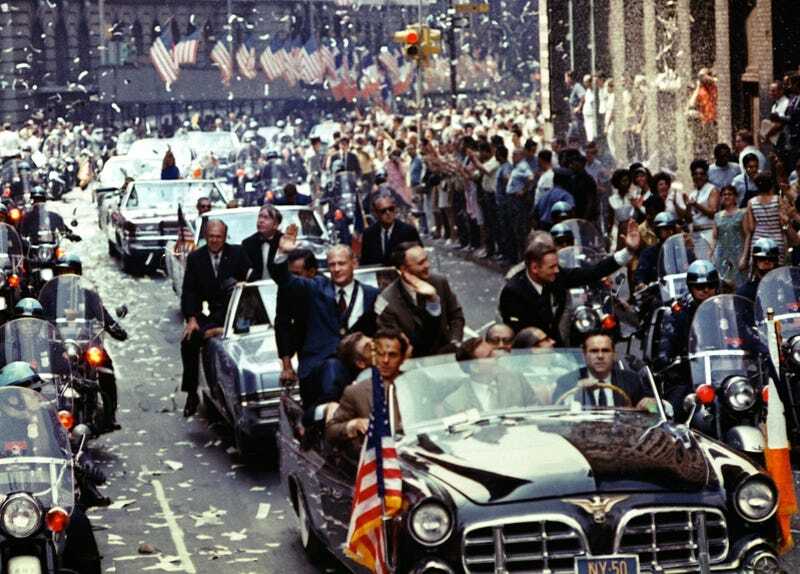 The anniversary celebrations will conclude on the 24th, when the astronauts splashed down safely in the Pacific Ocean. It's sobering, almost unreal, to realize America has been sending people into space for over half a century and to the moon for nearly as long. Of all the topics covered, I was most unexpectedly touched by the segment on the women who constructed the custom-fit space suits. It's an overlap of all my favourite things: space science, industrial design, making things, and preparing for catastrophe! I also love the incongruity of something so high tech, quite literally space age, being done by hand. It's very personal, as each of the women explain how deeply they take their responsibility to do high-quality work. As one of the ladies explains, "Well, when they're up there in space, you know what parts you've worked on, and you just say, 'Well, I hope that part don't fail because I'd feel it was my fault if it did.'" The women discuss how they'd like to go to space themselves, ending on how they'd like to go while wearing the suits they'd constructed because they could depend on it. It's adorable, emotional, and so very, very human. I know, you're not actually going to settle down and watch a 1 hour, 45 minute historic documentary on a Thursday afternoon. But add it to your to-watch queue for the next time you need something nostalgic and awe-inspiring. It's worth it. Image Credits: NASA. Tip via Universe Today.